My Mercedes ML320CDI (2007) had a mind to play up on the motorway and put me in some hot water with regard to the vehicle being totally disabled. Looking back, I had noticed a few symptoms over a month or two that I had not connected to the real underlying issue that would eventually completely put me out of action on the M6 only ten miles from home! The month running up to event I had noticed an occasional hard change down at slow speed when coasting to a halt, I simply put this down to the foibles of the 7G-tronic gearbox and ignored it. There had been a very slight groaning noise on particular right hand bend on my daily journey to work and again, unless I was listening for it it just got ignored. Then one particularly wet day the ABS, ESP and Tyre pressure monitoring inoperable warning appeared on the dash – everything seemed fine, I found a safe place to turn off and restart the car, everything was fine. I had a very early morning trip up to Liverpool and it was an awful day with heavy rain and large amounts of surface water on the road, I got to Liverpool without drama and pulled up to a set of traffic lights as I slowed there was a really loud groan, almost like a passing jet under power take off – I actually dismissed this as just that, thinking it was a low flyer out of John Lennon Airport. I parked up and went about my business. About three o’clock I set off from the carpark, through the town and joined the M62 back home. Later joining the M6 southbound is where the fun would really start! Outside lane of one our marvellous SMART motorways saw the dashboard light up like a Christmas tree, ABS, ESP and Tyre Pressure Monitoring not working. I eased off the throttle and it became obvious the car was holding in a single gear. As I could not quickly get over to lane one (not as it would have done me any good as there was no hard shoulder now thanks to the SMART motorway improvements!). It took me a few miles to get myself to a place of less burden. Each time I pressed the throttle the ESP triangle would flash stopping doing so when I lifted off the power. I made the decision I was going to try a rolling restart in an attempt to reset the problem – big mistake. After selecting N and turning the engine off and on again I had no drive at all and the gear selector stayed in N no matter what I did with the lever. Attempt 2: off and on, this time I had drive in what seemed like second gear, useful rpm’s at 50mph! Enough was enough and given the circumstances I decided to hang in there and sweat it out, locked in a single gear – it was certainly far better for me than the ‘no drive at all’ option I had adopted earlier. So I got off the motorway and pulled over in the nearest layaway I could find – what a relief! A restart and off we go, the ABS and ESP warnings still lit, as soon as I hit 4mph the brakes activated on what seemed like all wheels and bought me to a halt, it was impossible to move the vehicle above a slow walking pace. Many restarts later it was obvious this was not going to rectify itself and I called the RAC….. That will be four hours wait sir! I called up a friend as I was only ten miles from home and he took a detour past my house and collected the Autel code reader en route. He arrived some minutes later and we plugged in. Wow! anything speed related had flagged a fault, including gearbox, steering, ETC/ESP Instrument cluster, the lot. I cleared them off one by one which eventually allowed me to clear every warning on the dash. I set off again and exactly the same happened, 4mph and all wheel ABS braking arrested the vehicle to a halt with no intervention my foot apart from pressing the ‘go-go’ pedal like mad, which I will add had no affect whatsoever. The rest is history, the ML was delivered home in style, I was impressed by the way the set up worked and to be honest was fascinated by the mechanical wizardry of it all. My car was limped into its parking place, the gates closed and left overnight. Still I might add with not one fault showing on either the dash or code reader. The following day I had convinced myself that it was a traction control problem and coupled up the Auto in live data mode. A short run down the road at crawling pace revealed the rear left wheel speed sensor to be counting at about half the impulse counts of the other three wheels. Sure enough as the speed rose above 4mph the brakes applied and halted the vehicle. Off came the wheel and the sensor removed, there looked little wrong with it, no rust debris stuck to it as you often find. I used a torch down into the sensor pocket and it looked clean and dry. I have seen similar sensors on Jaguar hubs that live in a debris filled pocket that builds up and wears into the seal of the hub bearing. Once water gets to play in here the magnetic poles embedded into the bearing seal start to delaminate. Once this happens there is no hope in changing the sensor. The complete hub bearing has to be replaced to renew the magnet pole ring within the bearing oil seal. Fortunately the ML’s seal looked in fine condition as far as I could see down into the sensor pocket on the hub carrier. 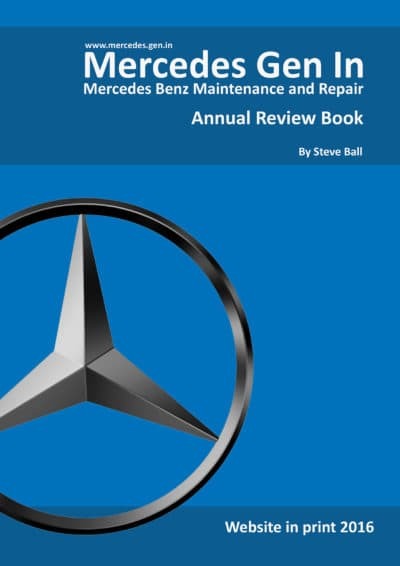 The later wheel speed sensors we see on these and later stable Mercedes are ‘Active’ sensors. These have some electronics built into them and are basically a ‘Hall Effect’ device that reacts to magnetic fields passing through their target area. The ring of ‘miniature magnets’ that are moulded into the bearing seal are ordered North, South, North, South and so on making up a full 360 degree angular device. Because the sensor is electronic it can determine wheel speed far more accurately than older ‘Passive’ inductive types (the toothed wheel of yester-year) because of the modern arrangement the sensor can determine rotational speed from a standstill and even detect direction of rotation! I think the problem with my sensor was it was only detecting either North or South poles from the sensor ring and not both, this would have halved the impulses measured as I saw on my live data. There was no fault present since I cleared them because the ESP traction control was controlling exactly as it should given the wheel speed information. Let me explain. One wheel gives speed information slower than the other three, the electronic controller thinks three wheels are spinning and applies forced braking to those faster moving wheels to control the vehicle. Of course this is not actually the case but in terms of what the controller sees it is reacting as it was designed. Replace the sensor. Very simple one small bolt on the hub carrier and the sensor withdraws. There is a single connector about 250mm away on the upper suspension arm from which the sensor simply unplugs. 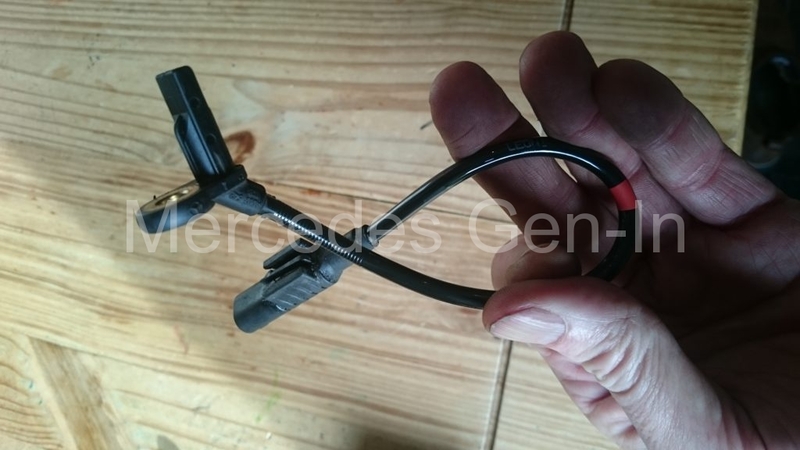 Mercedes Benz want an eye watering £99.00 plus vat for a genuine ATE wheel speed sensor – err don’t think so guv! Our local motor factors had a pattern part on the shelf £24.00 No brainer? So replacement sensor fitted, a final clear down of any fault codes and we were away. Perfect fix. A couple of other things became apparent, the slow speed gear change harshness had gone, the slight groaning no longer present in the particular corner on the way to work and how about this… – The Hill Start Assist actually worked far better than it had ever done, only previously working as well in reverse! Transformational and a fantastic low cost fix to what appears on the face of it to have been a ‘big ticket’ job.